Regional Local Community Advisory Groups provide strategic advice to our local Boards around matters relating to our customers and stakeholders. Local Community Advisory Groups ensure we meet our community's needs and are a legislative requirement under the Local Land Services Act 2013. Murray Local Land Services has three community advisory groups operating in the Murray region: the Murray Local Community Advisory Group (Murray LCAG), Murray Aboriginal Technical Group (MATG) and the Murray Regional Weed Committee (MRWC). Please see below for further information on our community advisory groups. The Murray LCAG is comprised of 15 community members who have widespread experience and expertise in agricultural practice change, natural resources management, local government and rural social issues at both the local and regional scale. The Murray LCAG is a sub-committee of the Murray Local Land Services (MLLS) Board. The Murray LCAG meets quarterly to discuss NRM, sustainable agricultural issues and land management issues in the Murray region. These meetings aim to provide the Board with recommendations on how MLLS can effectively engage with the community through its activities and programs and ensure that the community’s needs are met by MLLS. Summaries, outcomes and communique from these meetings can be found below. * As a requirement of the Local Land Services Act, the Murray Local Community Advisory Group (LCAG) was established in 2014. Tony was a founding member of Corowa District Landcare in 1996 and has since been chairman and long standing committee member. Tony operates a mixed farming business North of Corowa. Tony managed a grazing and cropping property at Rosewood, NSW for almost 30 years before re-locating to a smaller property in the Munderoo West locality. Tony has been involved in various farm and community organisations, including as President of the Tumbarumba Beef Improvement Association, and is currently a Councillor of the Shire of Tumbarumba. John is the current Chairman of Riverine Plains and manages a mixed cropping and sheep business near Barooga NSW. Colin grew up in the Conargo district, where he runs a 6,500 ha mixed farming operation of sheep and irrigated cropping. He has been actively involved in various local organisations and farming groups, including Ricegrowers’ Association, NSW Farmers and Conargo Fire Brigade. Colin currently Chairs the North Conargo Land Management Group. Neil currently runs the Ricegrowers’ Association of Australia Environmental Champions Program. Helen grew up in the Mallan district, where she runs the administration side of her family cropping, horticulture and sheep farming enterprise. She is also the Secretary for Western Murray Lands Improvement Group, a member of the Moulamein CWA Group and actively involved in Ricegrowers’ Association and Lower Edward River Pumpers & Landholders group. Allan operates a beef grazing property in the Ovens Valley and is a strategic research professor at Charles Sturt University in Thurgoona. His research examines the social dimensions of NRM governance and sustainable agriculture, including rural landholder engagement. Allan has been a participant in local and regional NRM groups, including the Murray-Darling Basin Ministerial Council’s Community Advisory Committee. Rick is a project officer with the Western Murray Land Improvement Group. Rick is passionate about maintaining viable and sustainable agricultural industries in the Murray region. Rob is based at the National Environment Centre (NEC), a specialist campus of the Riverina Institute of TAFE. Rob has taught practical sustainable farming courses for 25 years and is passionate about permaculture and organic farming. Terry has held the position of Jerilderie Shire President for several terms and held the position of Mayor from 2004 to 2014. Terry is currently the Chair of Riverina and Murray Regional Organisation of Councils (RAMROC). Malcolm operates a dairy farm of 600 milking cows in the Blighty/Finley region. Malcolm was formerly the Chairman of Murray Dairy and is committed to ensuring the long-term viability and profitability of the dairy industry in the Murray region. Eric operates a mixed farming business in Bungowannah, where he is the fourth-generation to manage his family’s mixed farming enterprise. He is currently the Chair of Corowa District Landcare. Eric is interested in raising awareness of alternative farming practices to improve soil health. Felicity was born and raised in Tumbarumba on her family’s sheep and cattle farm. She has worked in grazing land management in Central Queensland and held several different positions at the Murray Catchment Management Authority in Albury. In 2013, Felicity returned to the family beef business in Tumbaruma where she currently lives and works. Phil grew up on a dairy farm at Mittagong in the Southern Highlands, NSW. Phil and his family now operate a 700 ha farming business in Tocumwal specialising in irrigated lucerne and cereal hay production. In 2007, Phil invented a sustainable and economical large hay bale covering system that is now widely distributed and has attracted a number of awards. He is also been involved in a wide range community groups and has held committee positions in Southern Growers Farming Systems Committee, Fuller Road Landcare and Berriquin Irrigators Council. Dale is the CEO of Holbrook Landcare Network. Dale has an extensive background in Sustainable agriculture having been employed in the region since 2002 in a range of roles with Landcare, NSW Department of Primary Industries and Catchment Management Authorities. The Murray Aboriginal Technical Group (MATG) was formed in May 2012 from the former MAAG (Murray Aboriginal Advisory Group) and is a formal sub-committee of the Murray Local Land Service’s (MLLS) Board that helps guide the way MLLS collaborates with and supports the community across all areas of our business, including specific Aboriginal programs. MATG is an an advisory body under the overall direction and guidance of the Board, acting as a vehicle for the Aboriginal community to have a real say on the development of appropriate MLLS processes and structure. Guiding principles of the MATG include the recognition of Traditional Owner groups and the importance of their role in cultural heritage, cultural economy, cultural knowledge and connection to country. Made up of seven Aboriginal community members the membership of the MATG is skills based reflecting a diversity of knowledge and experience in Natural Resource Management from the Aboriginal community across the catchment. Members must work in the interest of the whole community rather than specific organisations or other individual interests. The MATG meets quarterly. Meetings take place throughout the year covering each end of the catchment and business on the agenda at each meeting is considered at the strategic level. Summaries, outcomes and communique from these meetings can be found below. 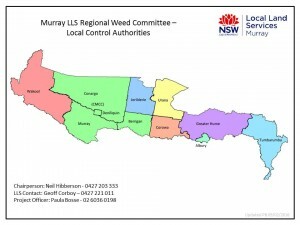 The Murray Regional Weed Committee (RWC) is established as a Community Advisory Group under the Local Land Services Act 2013 (the Act). This committee (in conjunction with the Riverina RWC) replaces the Eastern Riverina Noxious Weeds Advisory Group & Western Riverina Noxious Weeds Advisory Group (ERNWAG & WRNWAG). Inaugural meeting held in Corowa, 3rd December 2015. To provide ‘tenure neutral’ strategic planning and coordination of weed management activities at the regional level. These activities play an integral part in an overall state weed management framework. provide a forum for the community and stakeholders in decision making, and develop a communication, education, training and awareness program based on local and/or regional priority weeds and issues. prioritise target weed species and recommend weed policy, declaration, control and promotion to member organisations. promote effective and efficient collaboration and co-ordination of weed programs, and promote resources and information sharing between member organisations. Liaise, were necessary, with other RWC to develop and deliver weed management plans. Further information can be found in the Terms of Reference or via FAQ.